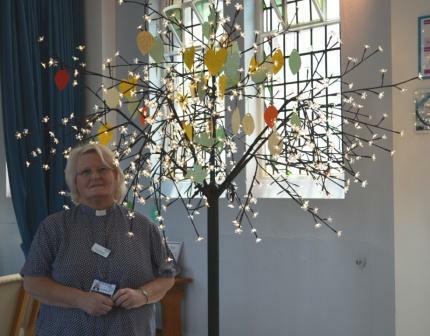 Patients, family and friends have a new way to express their prayers with the introduction of beautiful light-up prayer trees at Sandwell and West Birmingham Hospital’s NHS Trust. Worshippers and visitors can write their prayers on leaf-shaped cards and hang them from the trees, which are located in the chapels at both the City and Sandwell Hospital sites. Previously, the chaplaincy used branches and twigs donated by trust gardeners to form the basis of a prayer tree, but in response to requests from patients and staff, a more permanent tree was decided upon. Lead chaplain, Rev Ann Stevenson, said: “We have had prayer trees in the chapels before, for Thanksgiving and ITU memorial services in particular. However, they don’t last long and when we asked people, there was an overwhelming desire to have something more permanent.